Ana and her best friend Lily love to cook and come up with new recipes together, but when they are assigned an Explorations project at school, their teacher Mr. Creed assigns them partners and refuses to budge. Lily gets paired with Via, who is interested in a cooking project but thinks mayo mixed with sugar is okay for frosting cupcakes, while Ana gets paired with new girl Dana. Dana goes by Dasher because her family raises sled dogs and has just moved to the Midwest from Alaska. She's a bit outspoken and slap dash for Ana, who is dealing with OCD. With the help of her supportive parents and Dr. Taylor, Ana is able to control her compulsion to clean and wash her hands fairly well. She also has a guinea pig, Bernie Toast, who helps with her stress levels as well. When Ana and Lily fall out, and Ana has to deal with messy dogs and a new friend who doesn't know her whole story, she does struggle a bit. Eventually, she works through her problems with Lily, takes chances on new life experiences, and continues to learn to manage the more problematic manifestations of her OCD. Strengths: This is a fun, engaging tween read that also offers good information about OCD on a level that young readers can understand. 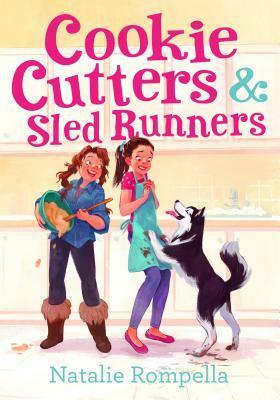 The mix of cooking, dogs, and friend drama will make this a sure hit with middle graders who want an amusing yet insightful story-- and the cover is great! Weaknesses: Mr. Creed seems a bit over-the-top mean, and I could see parents at my school really complaining about the whole Exploration project! What I really think: At first, I wanted the book just to be about Ana, Lily and Dasher going through a typical middle school experience, and was sort of bored by the OCD parts. However, Rompella does a very good job at striking just the right tone-- Ana isn't magically "cured" but makes progress, her friends are understanding, and her parents get her the help she needs and make sure she follows through with her therapy exercises. Based on her 2015 adult book, Voices in the Ocean: A Journey into the Wild and Haunting World of Dolphins, this is a brief overview of how dolphins are treated around the world, and how Casey investigated these treatments by visiting many of them and talking to scientists, locals, and activists. Highlights include: a town in Japan where dolphin tourism has arisen because the fisherman kill and sell dolphins; a much kinder town in Ireland where there is a celebrity dolphin, Fungie; and several different facilities where dolphins are kept captive so that people can interact with them. Information about how dolphins act, socialize, and react to humans is provided along with these anecdotes about the author's experiences. There are eight color pages of dolphin pictures in the center of the book, and a fairly extensive bibliography. This is a good length-- just under 200 pages, so readers who are very interested in dolphins will be glad of this when narrative nonfiction is assigned for class projects. The cover is quite appealing, and it is great to have more tween friendly versions of adult narrative nonfiction. I wish that this had been more organized and had fewer descriptions of how Casey felt about the various situations: e.g. students will not care that she started her journey because she was sad that her father died. It also would have helped if pictures had been spread throughout the book. Dolphins is definitely a book that I will share with my Grade 4 teachers. They have a unit about taking a stand and have to create an infographic and opinion essay about a cause. Thanks for sharing! We generally go to St Simons Island, off the Georgia coast or North Myrtle Beach in SC for vacations and almost always see dolphins--whole schools of them sometimes! Thanks for these reviews. I will keep an eye out for them at my library. The Dolphins books sounds fascinating. What an unusual title for the first book. I keep seeing more books that include cooking. This is a must read for me since it involves OCD -- I like to share stories like this to my website. I like anything about dolphins! This sounds like an important. Loved your review of Cookie Cutters and Sled Runners. So important for readers to learn that characters' problems don't always get "solved." What an intriguing pair of books! I love that there are so many more books out with kids cooking--I was a wannabe cake decorater in my youth, so can easily relate. It's nice to see stories where children aren't magically "cured" of their conditions, but rather find ways to live with them as best they can, which is really what life is all about! I agree with the above poster. Cookie Cutters is such an odd title! I appreciate your honest reviews! I suspect that I would have preferred to read Cookie Cutters & Sled Runners rather than John Green's book, Turtles All the Way Down. It would also fit better into an elementary school library. I always appreciate your honest and thorough reviews. Thanks for letting me know about these books.